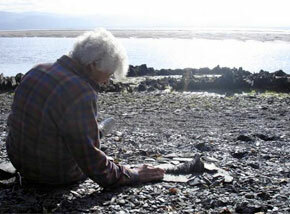 The World Beach Project was devised by the artist Sue Lawty, in association with the V&A. It ran for 5 years, from 2007 to 2012. 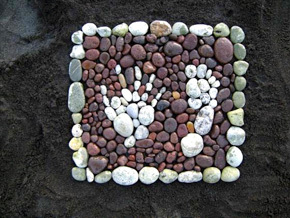 The Project was global in scope and open to anyone, anywhere, of any age – participants simply uploaded photographs of their own patterns made on a beach with stones. The idea for the project originated from Sue’s work as V&A Textile Artist in Residence in 2005. You can read more about Sue’s work on her blog: Concealed, Discovered, Revealed. 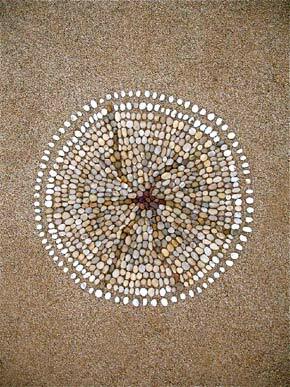 The particular inspiration for the World Beach Project came from Sue’s work with patterns made with stones. This meant that for the Project there would be no seashells, seaweed, driftwood or other flotsam and jetsam commonly found on beaches. It also meant no drawing in – or shaping of – sand; just stones and nothing else. 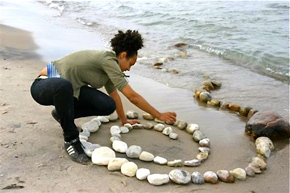 With these simple rules, the project built on the experience many of us have of making patterns on beaches and shorelines, combining the simplicity of making patterns with stones with the complexities of shape, size, colour, tone, composition, similarity, and difference. 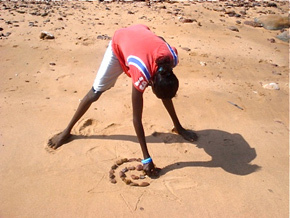 Entrants were asked to upload three photographs of their own project – one of the beach, one of the process of creating the project and one of the finished artwork – along with a short description about their experience. These were then added to an online, searchable, map of the world. 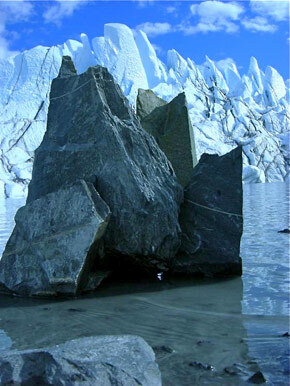 By the close of the project in July 2012, over 1,400 entries had been added to the World Beach Project with entries from all age groups and from every continent – including one project from Antarctica. Lovely sunny morning. Inspired by the geology - vertical slates embedded in the sand. 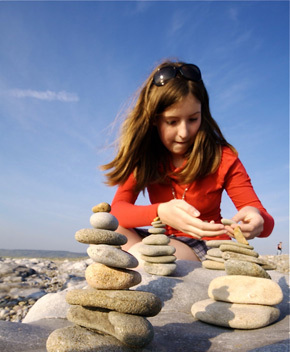 My young daughter and I began to collect and sort different coloured stones into piles as we often do at the beach. This pattern started to develop by contrasting the large slab of white, speckled textures and delicate smaller coloured stones. 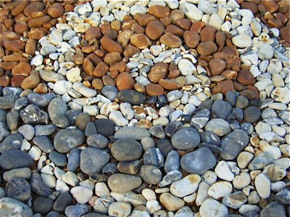 The stones on the beach create a beautiful natural randomness, from which I have created a temporary sense of order. 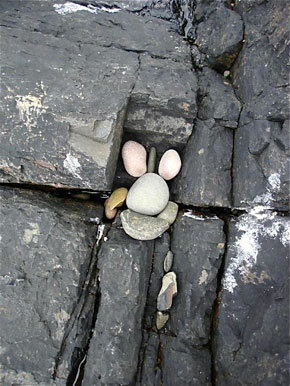 It is satisfying to know these stones will return back to natural randomness with the next tide. 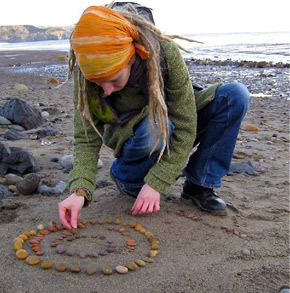 Grace and I started by selecting a range of pebbles, we then sorted them into piles depending upon their size and colour. 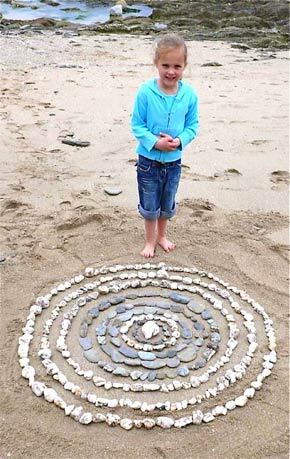 Once we had sufficient pebbles/stones we set about making our pebble circle, starting with Grace's favorite big stone as our centerpiece. 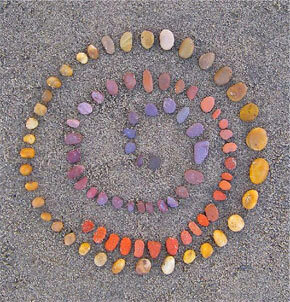 I spent a couple of hours sorting stones into piles of primary and secondary colors. 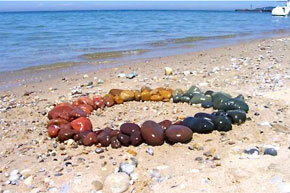 I arranged them in a color wheel, then put the arrangement in the water a few feet off shore. This is an amazing beach with unique geology and also part of the Jurassic coast. We spent New Year staying here. We searched for the whitest stones and arranged them like the spines of a buried dinosaur over the ridges of the steeply shelving beach. The line drew our eyes to the sea and to the sky. Project for Visual Art class at Sir Wilfred Grenfell College. 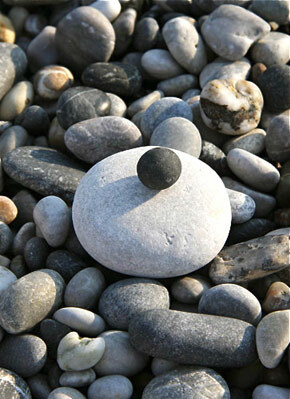 The abundance of smooth, round chalk pebbles was too much to resist. They can be stacked by placing a large flattish one on a 'tripod' of three small ones, and repeating to make a slender tower. I found the little rounded flint with a cleavage and just had to find the rest of her! 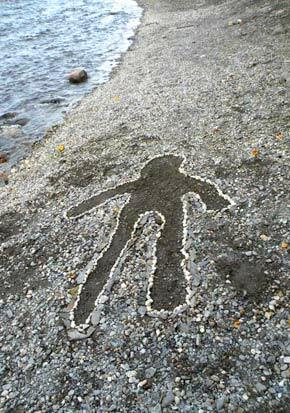 My daughter, Naomi helped me to look for the elongated flints to make her limbs. I have often thought flints from this beach look vaguely anatomical and bone-like. First I was just thinking about making a symbol. But in the end I decided to make something else. I made a little monster. I climbed up on top of a rock and I was looking around for loads of good stones. When I made the first little monster I decided to make another one. 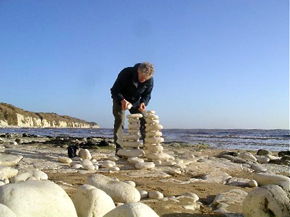 These smooth white chalk stones started to look like bones and Ben the dog couldn't leave them alone. So we created a spinal design to echo the edge of the cliff face... New Year's Eve and we were completely alone on the sand. 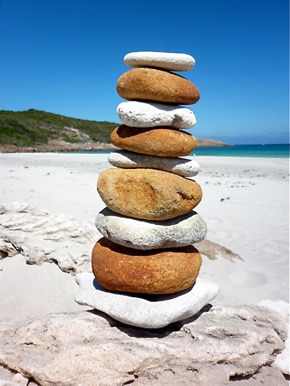 The stones on the beach are really smooth and perfect for stacking. 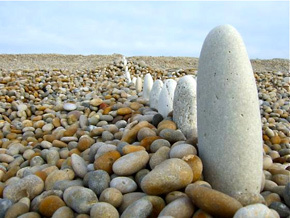 We wanted to create an illusion of a large pillar of stones on the beach. We were lucky to get onto the beach as it had just been raining heavily with a thunder storm further along the coast at Flamborough. There was an assortment of stones to chose from but we chose to collect flat ones. We stacked them on top of each other to form a striped tower. 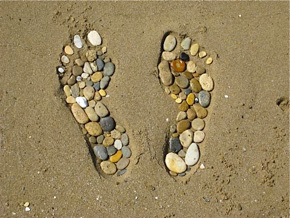 Leave only footprints... 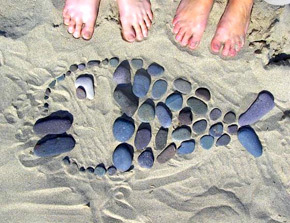 The beach was deserted and a couple of bone looking pebbles provided the idea of feet. Shortly after we'd completed the right foot a wave came in and completely washed them away. 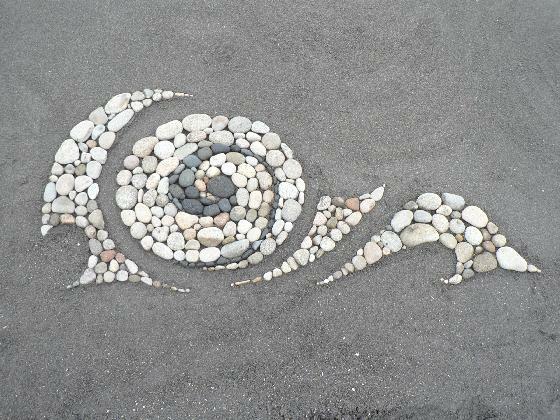 Of all the different coloured stones on the beach, the white ones stood out the most, so I used them to make a spiral; something simple, but elegant. This was a spontaneous piece of work that came about during a day on the beach. 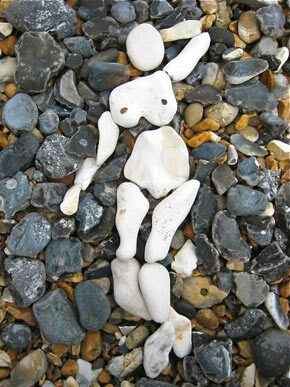 Our son often draws pictures of his beloved teddy bear, and his same eye was drawn to the bright white stones dotted on the dark gravel beach with which he created the limbs and body of this stone image. Kardamili is a beautiful beach cloaked by the Taygetos mountains. 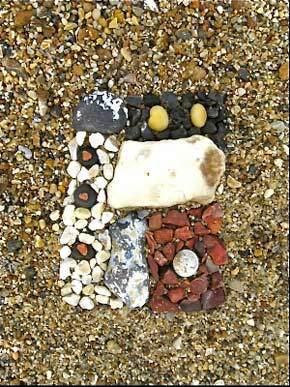 The beach pebbles are an ever changing canvas. 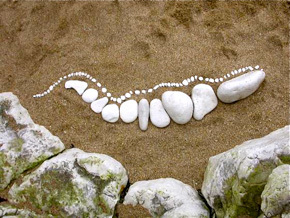 I placed white and black stones above the shoreline on the still wet pebbles to create a line, a suggestion of order. All the while my children played in the sea. I wanted to take the line in to the distance but as the day ended it had to be foreshortened. My father, who made a home for us all near here, died 4 years ago almost to the day - my thoughts are of him as we head home. My first time to an English beach. 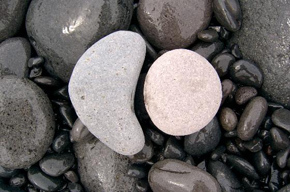 I love these amazingly colourful pebbles of all shades. 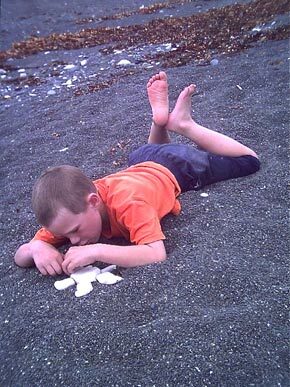 I laid them in different patterns in the wet sand with cold clammy fingers. 'Nature does a better job' I hiked onto the glacier. I found some rocks. I arranged them to resemble the mountains. Our serpentine creature travels between the underwater world of the lake and the land, between the unknown world of the ancestors and the living. For us it symbolizes continuity, connection, regeneration and hope. 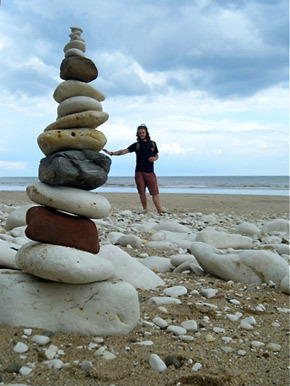 We started out just rock-balancing, and then Lizzie made these organic-looking towers. 8.00am and a fine drizzle. Time limited so I worked quickly musing over my line of attack should the distant greyhound run any nearer. Tide steadily encroaching, rehearsed escape route up rocks and returned with camera poised to catch the first wave touching the stones. I waited and waited... tantalized by gentle lapping water not quite reaching. But alas! Before I could snap the shutter a cheeky wave caught me unawares and my circle vanished beneath a swirling white froth! I had an idea to create something using contrasting wet and dry pebbles but had not realized how steep and unstable the beach was. Finally, after several attempts, dodging the waves (and getting my shorts wet), I managed, pebbles in one hand and camera in the other, to produce a rather minimalist piece! Still, an enjoyable experience! Suddenly I felt it would be nice to reproduce the imprints of my hand and feet with the hard to find white stones contrasting so nicely with the black sand of the beach. 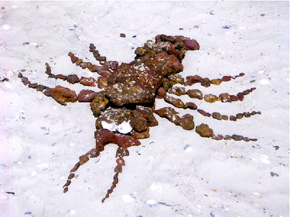 The red knobbly texture of the stone scattered along the beach instantly reminded me of a crayfish and is highly admired by locals and visitors alike. May they grace our beautiful coast forever. 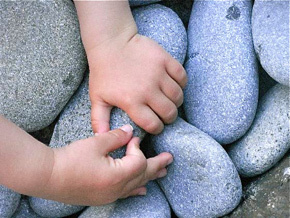 I looked (with my children) for stones with holes. We tried to put them in a line. We've been waiting for the right hour in the day, in order to have the sunlight passing through the holes and the sea visible in the holes and then take a lot of pictures to avoid mistakes. This is one of the five projects we made. My husband and the children choose the favorite. Artists included: Bobby, Sally and Sam Crosby (ages 6, 15 and 16 years old); Geraint Crosby 'Dad' and Eleanor Rees aged 4 - plus Alison Rees 'Mum'. Walked a mile or so along coastal path from Solva, then clambered down to find this isolated pebbly cove. We made various sculptures including 'Big & Little Tuna'; a burial chamber; a stone circle and a face but decided as a group to show 'Running water' on this site. Saw no-one during its construction. Beautiful, serene afternoon. Traveling round Tiree's beaches, we'd been thinking about the lines formed by water meandering across the sand to reach the sea; how they're altered by natural events and human actions. 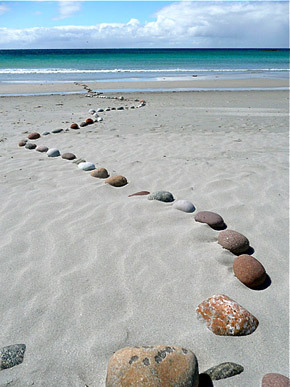 At Traigh Ghrianal I made a stream of many-coloured stones, flowing from the storm bank into the waves. 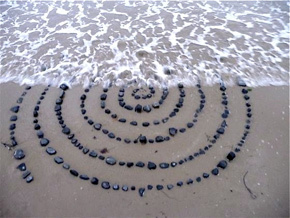 I used the smallest pebbles at the water's edge so that the incoming tide, gentle on this calm day, would begin to lap them into its own patterns as soon as I laid them down. 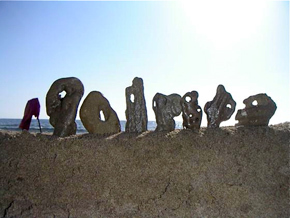 We used the stones on the beach to make our sculpture. Although we are no longer accepting entries for the World Beach Project, the project map is still live and all past entries are available for browsing.